As I suspected, it wasn’t too much of a challenge. Jake got in quick with the suggestion of a Sri Lankan Python, with Gina Allnatt, Kevin and Rhina Duque-Thues all agreeing with a generic Python sp. identification. Nicola Newton also suggested Python, but she was of the opinion that it was probably a Royal Python or Carpet Python on the basis of the size. I agree with Nicola and think that this is most likely the skull of a Royal (or Ball) Python Python regius (Shaw, 1802), based on the size of the specimen and the shape of the supratemporal and frontal bones compared to other Pythons I was able to find images for (if you don’t know which bones I mean you can see what I mean on a handy annotated picture of a Python skull from the Digimorph website). The skull is one of several similar specimens from the old King’s College teaching collection, so it’s a pretty good bet that the skulls came from either research animals or pets. The Royal Python is a fairly small African Python that is commonly sold as a pet because it has a mild temperament – so that helps offer a bit of support for the identification, although what’s really needed is a detailed identification key for Python skulls or access to good comparative material. The lack of good resources for identifying the skulls of snakes is a bit frustrating. 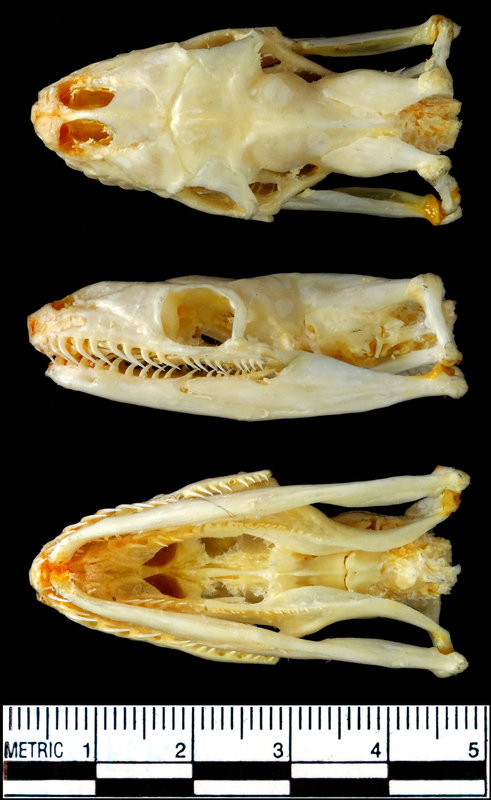 After working with bird and mammal skulls, where there are some amazing resources like Skullsite and the Mammalian Crania Photographic Archive I’m still searching for something similar for reptiles. Perhaps the Deep Scaly Project will deliver the goods one day… here’s hoping!